Want something refreshing? 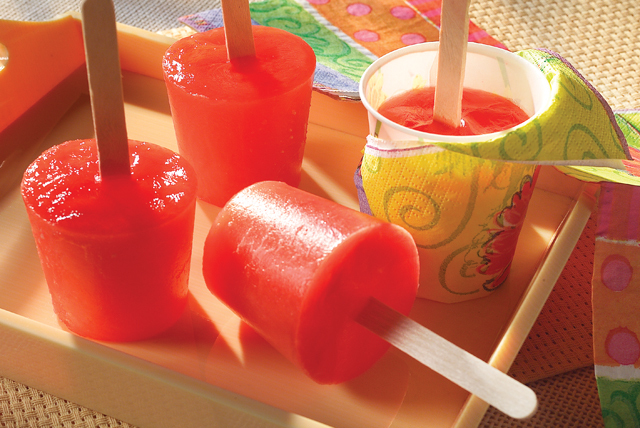 Our frozen strawberry pops use JELL-O® strawberry flavor gelatin. Try JELL-O® Frozen Strawberry Pops as a sweet treat. Add boiling water to combined gelatin mix and sugar in medium bowl; stir 2 min. until gelatin is completely dissolved. Stir in cold water. Pour into 6 paper or plastic cups. Freeze 2 hours or until gelatin is almost firm. Insert wooden pop stick or plastic spoon in center of each cup. Freeze 3 hours or until firm. Remove pops from cups before serving. Orange Gelatin Pops: Prepare using JELL-O Orange Flavor Gelatin and substituting cold orange juice for the cold water. Super Strawberry Gelatin Pops: Prepare using JELL-O Strawberry Flavor Gelatin and substituting 2/3 cup puréed strawberries for 2/3 cup of the cold water. Lemonade Gelatin Pops: Prepare using JELL-O Lemon Flavor Gelatin, reducing cold water to 1 cup and adding 2 Tbsp. lemon juice. Lemon-Lime Gelatin Pops: Prepare using JELL-O Lime Flavor Gelatin, substituting 1-1/2 cups cold carbonated lemon-lime beverage for the 1-1/3 cups cold water and using only 2 Tbsp. sugar. Iced Tea Gelatin Pops: Prepare using JELL-O Lemon Flavor Gelatin, substituting 1-1/2 cups cold presweetened iced tea for the 1-1/3 cups cold water and using only 2 Tbsp. sugar.